The Nexus 7 is still one of our top suggestions for people looking to get a great Android tablet. The combination of low price point with decent hardware topped off with it being a Nexus device made an impact. 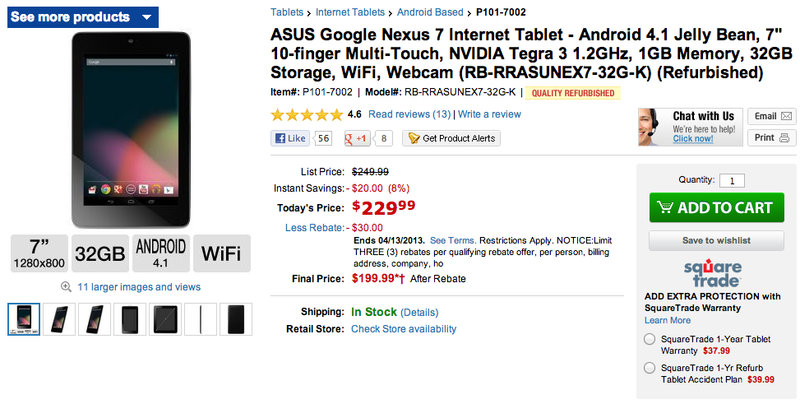 If you are looking for an even lower price point than $250, TigerDirect is shipping refurbished Nexus 7s for only $199.99 right now. This is the 32GB version of the device with only WiFi capabilities, but if you’re looking for a low price on a great Android tablet this would be pretty hard to pass up. You might be buying at a bad time however with rumors swirling that a rebooted Nexus 7 will launch at this year’s Google I/O, but that is a decision you’ll have to make.